Next pour in the wine that should cover the rice and let it evaporate completely. Once the onion and rice are dry, add the saffron and start pouring in the stock in small amounts, even a ladleful or two at a time while continuously stirring the risotto base. When each addition of the stock has almost evaporated add another one (again a ladleful or two, never add too much). I like to cover the pan with a lid and let it rest for no more than 2 minutes but you can of course serve the risotto immediately. Very often in Lombardy this saffron risotto serves as a bed for osso buco (see the recipe). 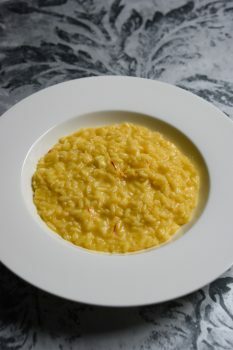 I personally prefer a potato puree with parmesan cheese instead and enjoy the risotto alla Milanese on its own.